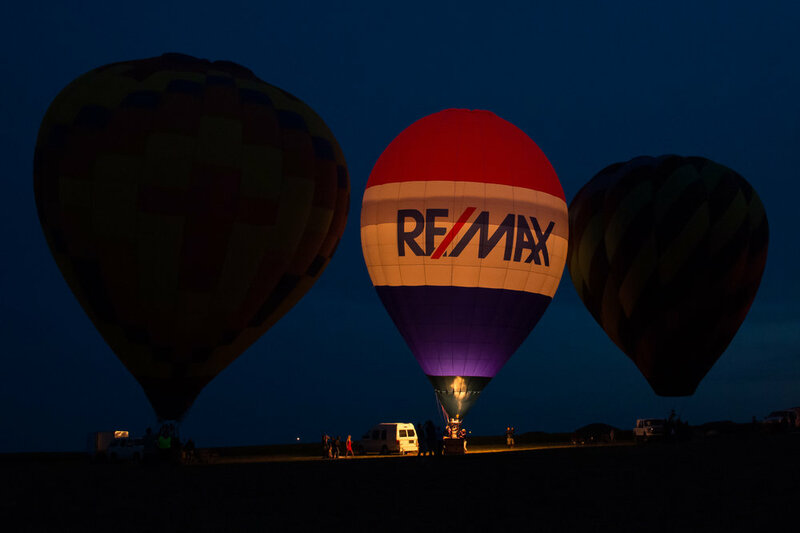 I went to the Nebraska Balloon and Wine Festival to try to capture the "glow" - that moment when all the hot air balloons fire up their flames at the same time in the evening. It's a nice photo opportunity, if the weather is right! I was surprised by the people at the event, thousands of people on a nice Saturday night. The Wine portion of the event was a bit underwhelming (there appeared to be more beer than wine), but that didn't stop people from enjoying the festival. When the time came for the balloon glow portion of the evening, the wind conditions were a bit too much for most of the balloonists to fill their balloons. 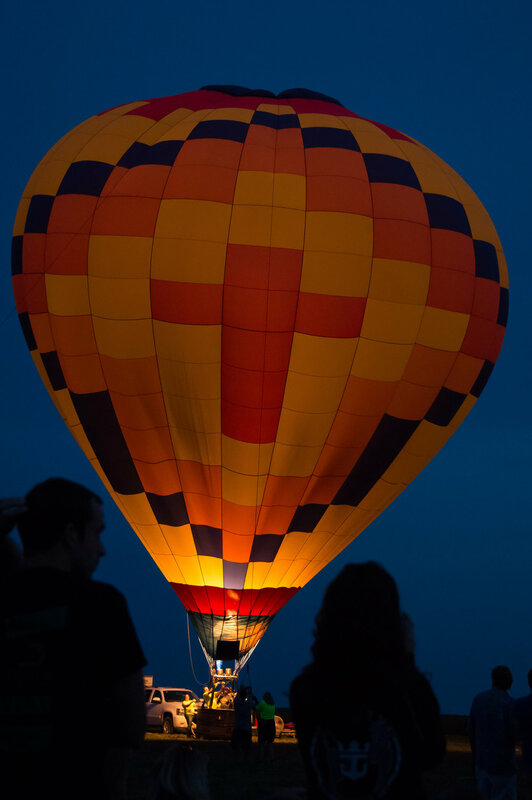 Of the dozen or so balloons, only about five were able to fill the balloon and achieve a glow. 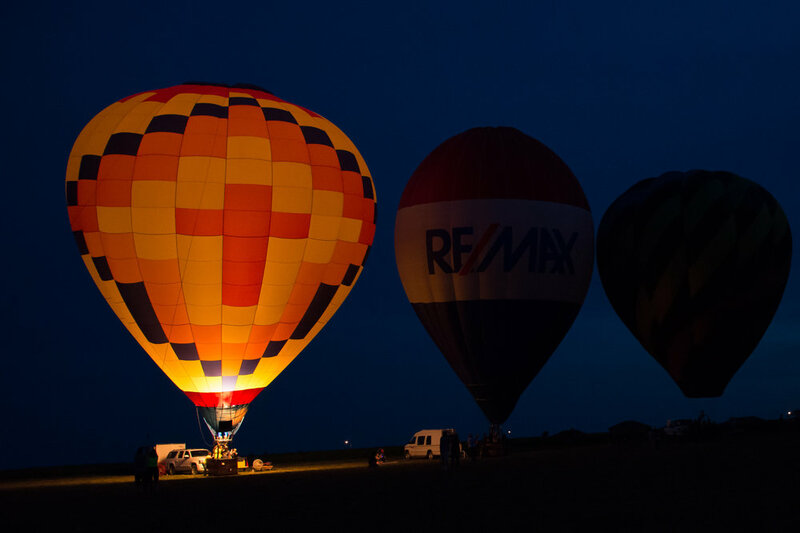 For a while, we got some interesting photos of one or two balloons glowing while the others remained dark. Overall, it was a nice event, a bit understaffed with long lines to get in and not really any organized parking. A beautiful night with some nice photo opportunities. Over the past couple weeks, I have had the opportunity to photograph a couple of season ending tournaments. The first was the Opening Round of the NAIA Tournament hosted by the Bellevue University Bruins - eight games. The second was the Big East Baseball Tournament hosted by the Creighton University Bluejays - six games. The photo above was taken in the first inning of the first game of the two tournaments. As soon as I took the image, I had a feeling it might be tough to capture a better image in the entire tournament. At least I set the bar high early on. Another keeper was this image where the batter was hit in the abdomen by a pitch. You can see the ball grazed and scrunched up the jersey. I noticed a new trend among some players to not button up the buttons on their jerseys all the way to the top, especially by pitchers. It leaves a distracting look that I would think would bother batters, but in both tournaments, the pitchers were allowed to continue to pitch. Another new trend seems to be "unique" celebrations after scoring runs. I have no words to describe this action. Of course, not baseball tournament would be complete without the dog pile by the winning team after the final out, and the team photo with the trophy. Above, from the Bellevue tournament. Below, from the Big East tournament. Next up, the College World Series in a couple weeks! We have a unique opportunity each spring in Nebraska to watch first-hand the migration of the Sandhill Cranes. As many as 500,000 cranes stay for weeks along a stretch of the Platte River around Grand Island and Kearney. I was on a hosted crane watch a couple years back and wanted to visit again. With an open schedule, I could check weather conditions to make the trip tolerable, and a couple weeks ago I headed out, alone this time. Thanks to the help from a couple other photographers, I had suggestions on where to watch the cranes in the evening, and where to head out in the morning. I arrived mid-afternoon and scouted out the evening/morning locations all the while photographing cranes in the fields. I headed to the evening spot as sunset approached and watch the cranes return to the river for the night. In the open, as I was, it is hard to get close to the cranes, but you can certainly see and hear them in the distance. The sunset was spectacular. Before dawn, I headed to the morning spot. As I left my car, the sound of the cranes overhead was incredible. I couldn't see them, but hundreds of cranes were flying directly over my head. For the next hour, as the sun came up, the sky was filled with the sights and sounds of the birds leaving their resting spot and heading to the fields for the day. After getting some sun rise shots, I found a spot near a river where some late risers were getting ready for the day, and I had chance to watch them take off and head past me to the fields. The gallery below has some images I took (click on the image to scroll through the gallery) before I headed back to the city. 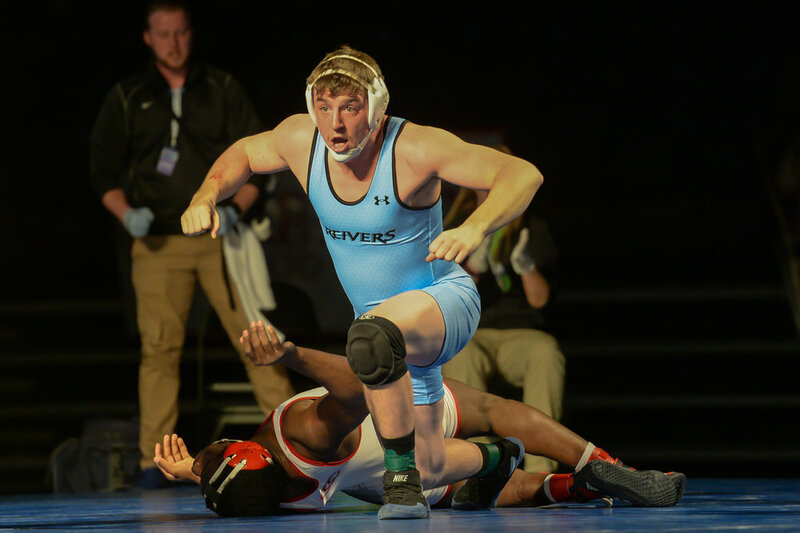 I have recently completed shooting a number of championship events at the high school and collegiate level, mostly basketball and wrestling. One of the fun parts of shooting these events is to see the the faces of the winners. The image above ranks as one of my recent favorites. The victorious wrestler went from almost being pinned to flipping his opponent and winning in a matter of seconds. Both wrestlers were in disbelief. 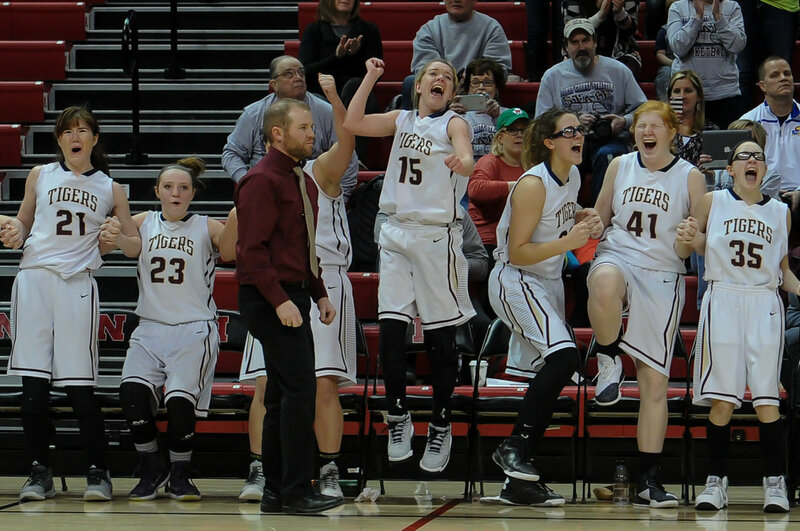 High school teams playing at the state tournament almost always celebrate a win, even in the early rounds of play. Playing in front of big crowds in large venues often brings the best out of team celebrations. As you can see from the gallery below, I am a sucker for game ending shots of the bench celebrating as the clock winds down to zero. Click on the images to scroll through the gallery. For days the weather forecasters called for ice - massive amounts of ice. For the first time in six years, Omaha had its first Ice Warning (yes there is such a thing)..
To be completely fair, we did get some serious ice conditions Sunday night into Monday morning, and I would say Monday morning the driveways and side roads were pretty bad. What made it worse was the light rain that fell on the layer of ice that was already on the ground. It was slippery beyond belief. But the temps stayed couple degrees higher than anticipated and the ice began melting to the point that by mid afternoon Monday our drive and side street were clear of all ice. While it would be easy to dog the forecasters for over hyping the storm, and calling off schools on Tuesday might have been a bit premature, the storm did cause some problems - we have a family friend with in the hospital with severe head trauma due to a fall. Mary Beth and I stayed in for most of the storm - other than to get these photos. The storm dragged on for 24 hours. We kind of felt the storm was a slow agony, not really knowing what and when to expect something to happen. We had visions of cars sliding, trees crashing, power outages, but fortunately we had none of that. Now, on to the rest of the winter ... although today the temperatures will hit 50 degrees! The day started with a volleyball match in Lincoln. I was able to add women's volleyball to the list of NCAA tournament events I have photographed (along with baseball, men's and women's basketball, and men's soccer) by shooting the Regional semifinal match between Penn State and Nebraska before 8,000 fans who showed up for a Friday morning 11am match. Penn State won the first two sets overcoming late Nebraska leads in both sets and the Nittany Lions had two match points in the third set before Nebraska roared back to take the set. The winning point in the third set created one of the loudest arena noises I can ever remember. Nebraska took the fourth set, setting up a fifth set where the noise got louder with each Nebraska point peaking at match point. Nebraska's coach said afterwards he couldn't ever remember being in a louder building. I will remember this match for being one of the most spirited and loudest crowds I have witnessed as a photographer, ranking with Doug McDermott's Senior Day game when he scored his 3,000th career point and the 2011 Nebraska v Ohio State game when Nebraska scored the final four touchdowns to win. This volleyball match will be an instant classic. Leaving Lincoln, I headed back to Omaha for a basketball game between Creighton and Longwood. Go ahead, look it up, the school does exist. Creighton broke an arena record for most points in the first half and cruised to a 113-58 very lopsided win. 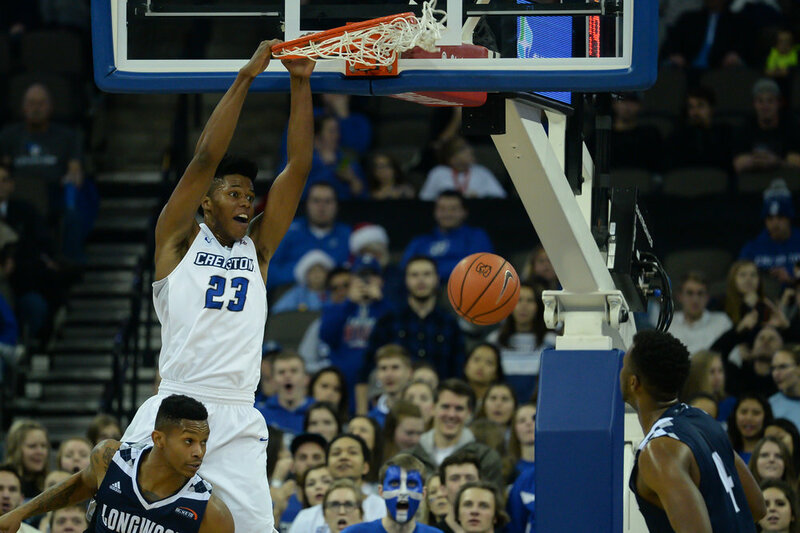 Creighton had nine dunks, eleven layups, made 12 three-point shots, and dominated in just about every aspect of the game. For me, the photograph highlights of the game came during breaks from faces in the crowd and the contests on the court. One of the first images picked up on the wire services from the game was of a fan in an ugly Christmas suit. This basketball game should be immediately forgotten, although the ugly Christmas suit might become an instant classic. 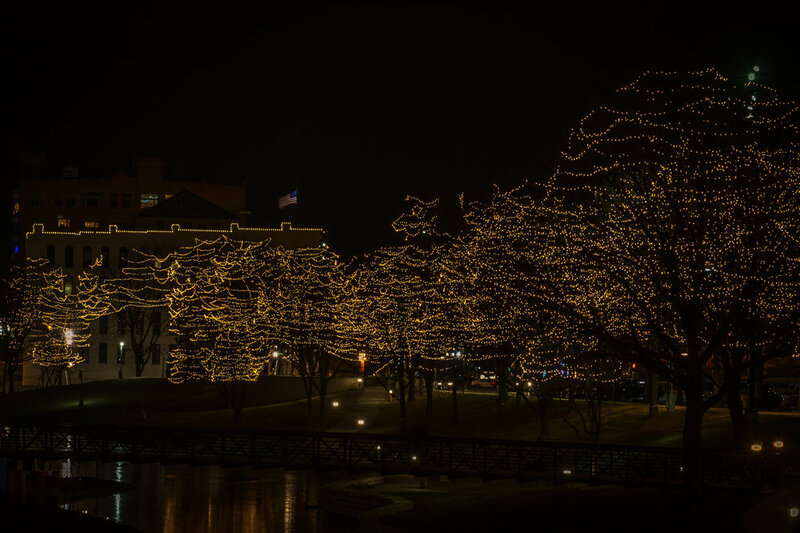 To finish off the day/night, I ventured over to the downtown mall area to capture some of the one million lights put up by the city for the holiday season. I visited the Georgia Tech campus with three college mates a couple weekends ago. We arrived in one of the busiest airports in the world from four airports within minutes of each other and an hour later were playing some really bad golf on a course a few minutes away. Of course I brought my trusty Fuji X-T1 with an 18mm pancake lens to carry around the weekend. One of the best team entrances in all of college football! One of the main focuses of the weekend was the homecoming football game against Duke. There was certainly nothing spectacular to write about the game - an early Tech lead, a miserable Duke comeback, a late touchdown to give Tech the win. As you can see from the photo above, the game wasn't even close to a sellout, especially with an noon kickoff. I had a late Sunday evening flight which game me an opportunity to walk the campus on a delightful fall afternoon. I wanted to capture some images of the Tech Tower. Even though the building appears to be undergoing some renovation, the iconic tower still stands out. Along with the "old" are some "new" features since my college days. The 80-foot spire was part of the campus renovations for the 1996 Olympics. The 3,000 pound statue of Albert Einstein was installed last year. To finish off the afternoon, I caught a couple innings of the Tech baseball team's fall inter squad game. When I attended games, there was no midtown skyline. The construction cranes indicate the skyline will continue to change. Next year is a reunion year for me which gives me another chance to take in game and see the campus. 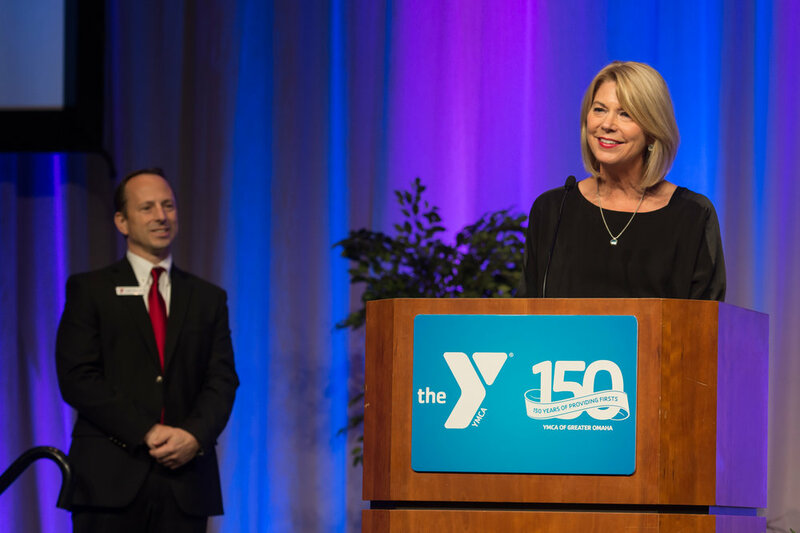 I recently photographed the YMCA of Greater Omaha's 150th Anniversary Gala event where Mark Spitz was the featured speaker. Mark Spitz speaks at the YMCA of Greater Omaha's Anniversary Gala. Mark Spitz talked about two things I'll remember from the event. The first related to the all the publicity surrounding Michael Phelps breaking Spitz's Olympic Swimming records. Spitz's comments were that every time there is talk about Phelps and the records Phelps broke, Mark Spitz's name is mentioned. Spitz said if they are still talking about you 40 years after you finished competing (1972 Olympics in Munich), that's not a bad thing. The second topic began with an audience participation exercise. Around 1,000 people attended the event. Spitz asked all the people in the audience to raise their right arms, then raise their left arms. After everyone raised their arms, he told the story of a boy who received a crisp, new $20 bill every morning from his father for 30 days which the boy placed on his dresser in a pile. Spitz then asked the audience to raise their hands if they thought the boy had $600 on his dresser after the 30 days. Then he asked the audience to raise their hands if they thought the boy had some amount other that $600 on his dresser after the 30 days. After looking at the show of hands for both questions, Spitz then went say that, in total, less than half the audience raised their hands to either question. Spitz knew that everyone could raise their hands, and most everyone could do the math, but less than half raised their hand to answer what amounted to a simple yes/no question. He compared this demonstration to what he has found in his lifetime. 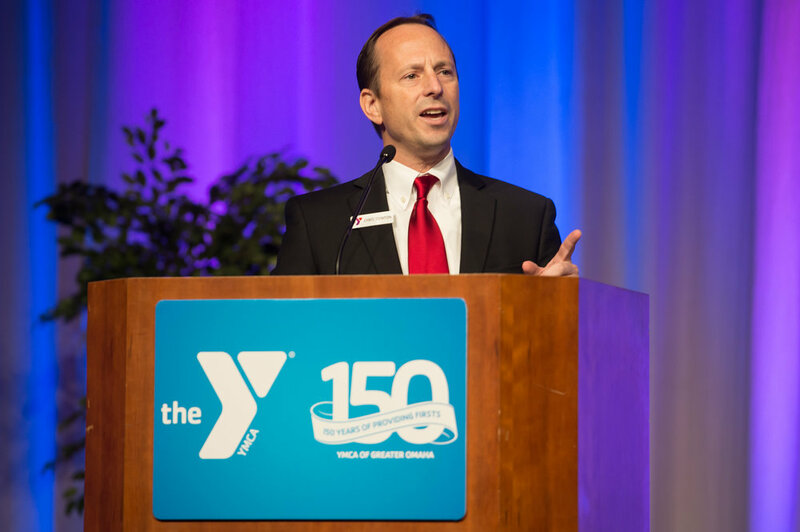 People who participate get a head start over those who choose to stand on the sidelines. In this exercise, over half the audience did not even participate. As a youth, he was at a camp and someone asked who wanted to swim. Spitz had not swum before, but figured he would try. He might not have gone on the the success he had in swimming if he didn't participate at that camp. So his message was to participate - be it jumping in a pool, in answering a question in a room full of people, or in a classroom exercise - give the experience a chance. You might become an Olympic Gold Medalist.